The presidential debates are performance art. They’re Kabuki. Summary: The presidential debates reveal little about the candidates, much about our political system, and everything about us as citizens. Part one of two. See part two: A reminder that debates are fun, not politics: Reagan had Alzheimer’s in 1984 and we didn’t notice. The Presidential debates display in pure form the nature of our elections: they are stylized performance art, and evaluated as such by critics. How effective were the candidates’ body posture, facial expressions, hand movements, tone and inflection of voice? How artlessly did they lie? Improvisation is, of course, highly valued. The ability to strike an emotional cord with the audience, to feign empathy, make witty repartee — all these things bring high scores. 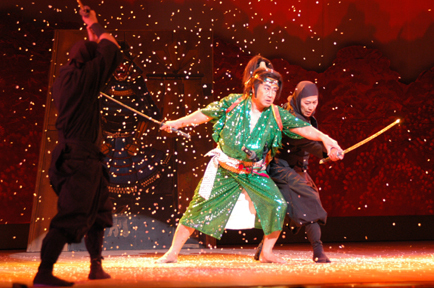 The debates are Kabuki adapted for an American audience, in two senses. First, they’re predictable: we learn nothing from the content. Second, they are entertainment for members of the Outer Party (the educated worker class, from 1984; see Wikipedia). For the proles as well, who watch snippets of the good parts on the news and YouTube — especially of any gaffes. Nobody expects what the candidates say during debates to foretell what they’ll do if elected. That’s been a fantasy since FDR ran to the right of Hoover in 1932 (cut those deficits!) and (like LBJ in 1964) as a peace candidate in 1940. Slow students learned this from Obama’s actions during the past four years. We don’t expect, demand or get fidelity of our leaders to their words. Look at the transcripts of the Lincoln-Douglas debates (& the Wikipedia entry). They read like term papers of today’s undergraduates. What’s changed? We have. We get the campaigns we want, and probably deserve. They’d not volley sound-bites with journalists if the reaction was public scorn and mockery. Why doesn’t one of the candidates challenge us, offering serious discussions of the important decisions facing America? These are intelligent men, with deep understanding of the issues. They could do so, but don’t. Such questions usually result from a failure of the ORIENTATION aspect of one’s OODA loop, a failure to see the world through the other person’s eyes. Imagine yourself as a candidate for high office, and you must win for the sake of America. Today you address an audience whose support you need for victory. But they are dogs. Do you discuss the perils facing the Second Republic? The delicate macroeconomic crisis? The complex process of globalization which America must master to prosper in the 21 century? Only a fool would do so. A rational person would promise free bones, slow cats, and an immediate halt to castrations. Anything more would confuse them, perhaps even anger them. An aroused pack of hounds can become dangerous. Elections will improve when we require that they do so. Not before. We need no tinkering with the rules, just the audience. (b) A good sign: the news media rediscovers the difference between fact and fiction! From their press release. Promises to improve everything but the weather: more jobs, lower taxes, lower deficit. No details how all this to be accomplished. A report card for the Republic: are we still capable of self-government?, 3 July 2008 — Comparing our campaigns to those of the past. Successful propaganda as a characteristic of 21st century America, 1 February 2010 — Campaigns are just the biggest stage. Previous Post Announcements of deaths and births. History in motion. 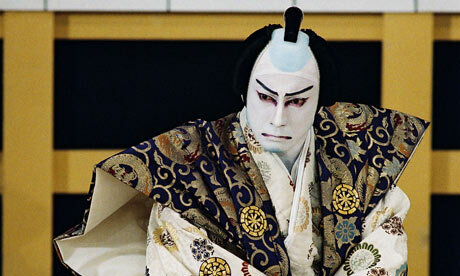 Kabuki is performance art. The presidential debates are pathetic. I think that if kabuki actors, who are serious professionals and artists, heard that you were comparing Obney and Romnana’s act to their art, they’d be lined up outside to complain. 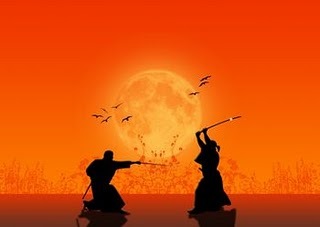 Addendum – many kabuki dramas revolve around serious issues of life and death, honor, loyalty, service, betrayal, and justice. If there was even a hint of those topics in the presidential debates, we might find them interesting. There are more than hints of these things in our americanized political Kabuki. Comic books and pulp fiction often have the same themes as Shakespeare and Tolstoy, just handled on a different level. That’s probably true. True artists often starve while hacks who pander to the public grow rich. Well, both Marcus and FM are correct. Our presidential debates are a very bad version of kabuki, just as Beef-A-Roni is a very bad version of Italian food. Brutal honesty. That may be the only antidote for us. Profound contempt is necessary, a nausea with what we have become — esp. by comparison with what we were and could become. Only from there will effective collective action and political programs become possible. Obligatory reference to the Seinfeld TV comedy occasioned by the mention of Beef-A-Roni. Unfortunately, the YouTube clip fails to show the most important part: the innocent victims riding in the carriage that suffer from the enormous quantity of revolting, rancid horse flatulence that erupts in the wake of the horse’s consumption of the large cans of discount Beef-A-Roni at Kramer’s instigation. In many ways, the clip has deep levels of metaphoric resonance with american politics. Obama and Romney are each spending about a billion dollars to get elected – four times what Bush and Gore spent in 2000. When one adds the unregulated PACs (political action committees) and Congressional and gubernatorial races, the cost of this year’s election is around $6 billion. The reason, of course, is television advertising. As the election draws near, some 80,000 political advertisements are running every day on American televisions. The entire ecosystem of lobbyists and politicians dependent on donations from corporate and other interests is almost entirely due to television. Eliminate the ads, which are forbidden in many countries, and American politics would change overnight. The astonishing thing is the uselessness of this potlatch. According to Nate Silver, the genius statistician, in every one of the fifty states, the presidential candidate who was leading in June – after the Republican primaries and two months before the conventions and the debates – is leading today. The overheated media, the pundits turned into sportscasters, the game-changing moments, the attacks and counterattacks, the yoyo-ing polls, the triumphant or devastating debate performances, economic statistics, biographical revelations and uttered banalities are purely entertainment. The numbers may change slightly, but essentially the voters made up their minds months ago. The US elections are not only dependent on television – they are television.